Green Cincinnati Directory - Includes over 250 of the great Green Building projects along with LEED Certified and Registered commercial buildings and home projects in the Greater Cincinnati region. Interactive map allows you to explore the area and plot your visits. 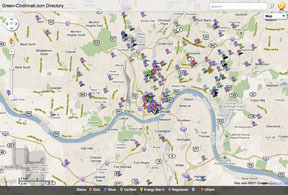 View Green Cincinnati Education Advocacy Directory in a full screen map. Green Cincinnati works with projects of all types to submit proper LEED Documentation and gain valuable tax abatements in Cincinnati. It's not as hard as it seems and we'll make learning fun! Download the directory (15 megs).